Spring marks a time of renewal, rejuvenation, and restoration. Buds burst from the soil. Birds build nests. Children rediscover the outdoors. And adults celebrate the season by cleaning and uncluttering their surroundings. This year, along with tidying the garage, attic, and basement, consider freshening your internal system with a detox diet. While detox diets may seem to be the latest trend, these eating plans actually parallel the natural patterns of our ancestors. Traditionally, the end of long, cold winters meant diminishing food supplies, while the balmy weather brought the year’s first, fresh produce. “Spring represents the best time of year for cleansing the body for many reasons,” says Brenna Hatami, a Denver naturopath and yoga instructor. Lighter foods become available, milder weather entices more people outdoors, and the liver is at its most regenerative. All these conditions contribute to supporting a major lifestyle renovation. That’s why Hatami chooses spring for her annual group detoxification program. Unlike many other eating plans, weight loss is not a primary function of detoxing, although these diets do usually result in streamlined profiles. Rather, detox diets focus on regaining or maintaining physical and mental well-being. “There are certainly many good reasons in our surroundings and routines to do a detoxification diet,” Hatami says. Additives and hormones in foods, toxins in our environment, and over-the-counter medications all stress our systems. “When we’re young, our bodies can keep up with many excesses,” says Elson M. Haas, M.D. and author of The Detox Diet. “Health problems often take 10, 20, or 30 years to develop.” So, the physical problems we begin to have in our 40s, 50s, and 60s are from habits we developed 20 or 30 years before. Most people eventually realize they can’t consume unlimited amounts of a highly-refined diet and continue to remain untouched by some medical repercussions. Advocates of detox diets point to the many conditions — both minor and major — cured or relieved by these plans. Conditions Haas treats successfully with detox regimens include allergies, high blood pressure, and high cholesterol. In addition, he says detox diets can strengthen fragile immune systems. “People with headaches, premenstrual syndrome, low energy, sinus and nasal congestion, poor digestion, and bad breath often notice improvement with a detox diet,” says Cathy Wong of the alternative medicine guide at the About.com website. “Joint pain, constipation, and weak hair tend to clear up with detox menus,” Hatami says. Irritable bowel syndrome and acid reflux disease, as well as skin conditions like eczema and psoriasis, are also relieved. “People with chronic diseases — for instance, arthritis, osteoporosis, heart disease, and even Type 2 diabetes — will find that a detox diet is the least invasive and the most inexpensive way to correct these maladies,” says Stephen Harrod Buhner, master herbalist, psychotherapist, and author of The Fasting Path. And anyone who has been exposed to PCBs can process this toxin out of their systems with a detox plan. Mention the words “detox diet,” and everyone has an opinion. Some people connect these regimens with middle-aged zealots. Others classify them just one more New Age phenomena. And many deem detox dieting yet another harmless, but ineffective, nutritional plan. While there’s no one, perfect detox diet or program for everyone, experts do agree on the foods that detox diets target. 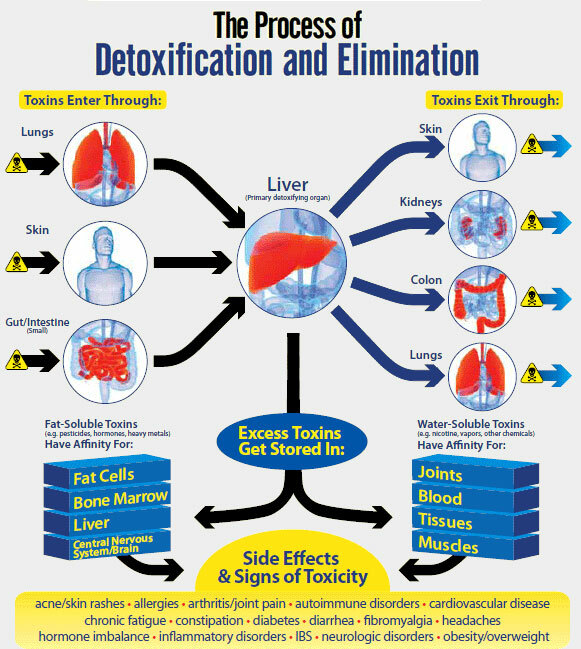 Even among advocates of detoxing, there is discord about what detox regimens involve. Depending on whom you consult, a detox diet may take many forms — from fasting, to juicing, to a simple low-fat diet. “Fasting can be an intense — and sometimes unpleasant — but highly effective experience,” says chiropractor Alan Goldhamer, author of The Pleasure Trap and founder of the TrueNorth Health Education Center in Penngrove, Calif. Since 1984, the TrueNorth program has promoted fasting as a tool to improve both diet and lifestyle. At the TrueNorth health center, a multidisciplined staff includes medical doctors, chiropractors, and bodywork specialists. These professionals combine their expertise to give patients holistic, integrated experiences, Goldhamer says. The program offers an ideal setting for a safe fasting experience. For those people with some interest — but limited funds, time, or will power — there are other options. “Juice fasting offers a great way to be initiated into the detox realm,” Buhner says. You can maintain your normal lifestyle while receiving many of the detox benefits. Haas credits a juice cleansing detox diet for changing his life 30 years ago. Not only did he find relief from his allergies, but his energy level also skyrocketed. Or you can choose a detox program that’s mainly steamed vegetables, fruits and whole grains, Haas says. By eating three meals a day for two or three weeks, your body will recover from many past abuses. For a custom-made detox plan that works with your lifestyle’s constrictions, locate a licensed naturopathic physician with extensive experience, Hatami says. A national directory at the American Association of Naturopathic Physicians website (www.naturopathic.org) allows electronic searches of close-to-your-home resources. And, by talking to some of the physician’s past clients and inquiring about the nature of the program, you will learn about her abilities and philosophies. The first couple days, some people experience mild fatigue, headaches, and cravings. They may have difficulty concentrating. But energy levels, mental clarity, and digestion begin to improve by the end of the third day. “People on a low-fat detox diet may actually spend more time eating,” Wong says. Chewing thoroughly while savoring the food’s delicate flavors becomes part of the detox experience. Detox diets give people the opportunity to try new recipes and discover new foods, she adds. Detox-friendly foods that people enjoy trying, often for the first time, include kale, collard greens, brown rice, and quinoa. “Dietary protein detoxifies the liver,” Wong says. A predominantly plant-based diet that includes beans and legumes, whole grains, almonds, and tofu can fulfill the protein requisite. Lightly steamed or raw organic vegetables contribute essential vitamins and minerals as well as other valuable compounds. For instance, simply by eating brussel sprouts, you’ll improve hormone and drug metabolization. For those individuals who don’t want to commit to a complete dietary overhaul, almost anyone can make small changes toward a healthier life by borrowing from the detox strategies. “Herbs, like milk thistle, assist with liver detoxification,” Hatami says. Increasing vitamin C and fiber — whether by supplement or by diet — offer safe alternatives to boost your health. By drinking hot lemon water in the morning, you substitute the usual caffeine-laden beverage for a liquid that has an astringent effect. And replacing your afternoon soft drink with a detox tea will benefit your constitution. “Just drinking more water or eating extra portions of fruits and vegetables will improve your health profile,” Haas says. Consuming a fresh salad every day can be a meaningful first step toward a better physical condition. The justification for doing a detoxification is twofold, Haas adds. One is to give your body a rest from the onslaught of contaminants in our food and in our world. And the second is to permanently improve food choices. After the detox experience, many people opt to make long-term changes, rather than return to their previous states. At the conclusion of his yearly detox experience, Buhner detects three major effects of the diet. First, there’s a tremendous sense of joy. Second, he has an enormous amount of energy. And third, he notices an exquisite sensitivity to wholesome cuisine, while the foods he craved before the diet — like chips, dips, and ice creams — he finds easy to refuse. And, perhaps, therein lies one of the greatest draws of the detox diet. These regimes seem to have the ability to loosen the grip of the harmful substances in our diets. And in this fast-food, sugar-coated, deep-fried world, that kind of outcome involves something a little more than coincidence and just a little less than a bonafide miracle. By Diane M. Marty a Denver-area freelance writer with a special interest in integrated health issues. Originally published in Body Sense magazine, Spring/Summer 2004. Gallery | This entry was posted in Deep Tissue Massage, Energy Medicine, Essential Oils, Health and Wellness Coaching, Holistic Healing, Massage, Massage Therapist, Our Center, Therapeutic Massage and tagged cleansing, Complementary and Alternative, Detox Diet, detox diets, Detoxification, detoxification diet, diet, Fasting, Health, healthy-living, Master Cleanse, medical, Nutrition, Shopping, weight loss. Bookmark the permalink.